FAQ Ellissi Engagement Rings, Get the best advice about Diamonds. If the information you need is not included on our FAQ page, please try the search function on the site. You may also like to request information directly, so feel free to Ask Ellissi. I’ve heard of the 4 c’s so selecting a diamond is easy, isn’t it? No, is the short answer. This is a very faq but in fact things are way more complicated. A diamond’s carat weight is something that is easily determined and verified. However, understanding the principles of colour, clarity and cut in diamonds is really just the tip of the iceberg when it comes to determining whether a particular diamond is a good example or a poor example of the grade it has been given. You can read more on this in a page we have written that shows some of the dodgy diamonds that are sold by some operators in the market place. Is The Diamond Independently Certified? The first question to ask is: Who is telling you what cut, colour and clarity the diamond is? Is the diamond independently certified and if so, by whom? The Gemological Institute of America (GIA) is considered the industry standard for certifying diamonds. Other labs use the same terminology as the GIA, but their standards are often different to the GIA. A grading report from a secondary lab may differ up to three levels from that of a GIA assessment. This is an assessment by both labs on the same diamond. The trouble with this is that consumers may believe that they are purchasing a diamond that has a high grade, because of the lower standards of the secondary lab. This is just one of the many issues when it comes to understanding the 4 C’s. Even at the GIA some issues arise from time to time in some grades, mainly because at present the SI1 – I1 levels have a very, very broad and wide ranging level of acceptance of some inclusions. Many of us in the industry feel that there should be a third level added to the SI category, so that there is SI1, SI2 and SI3. The GIA has so far resisted this option. At present the GIA is the biggest and best lab in a position to handle the volume of certification required by the diamond industry. It is the best we have. However, even with GIA certification, professional judgment and advice is still absolutely necessary when choosing a diamond. Two diamonds have been given the same grade by the GIA. Why aren’t they the same price? This is an area that often causes considerable confusion. Even though two diamonds have the same grade given by the same grading lab, no two diamonds are exactly the same. Where there are price differences, it is usually because a diamond may have just scraped into a particular grade level – say SI1. This could be on the borderline of being the next level down the scale – SI2. This diamond should be much cheaper than a diamond that is a very good “high” SI1. The good SI1 could be a borderline VS2 (the next level up). As referred to previously, the range of diamonds that could be assessed to be in the VS2 -SI1-SI2 and I1 is very very vast and wide ranging. This is why big differences in costs occur within the same grade level. Additionally, a diamond’s clarity is graded by what can be seen from the top. This means that issues underneath and on the side of the diamond do not always change the grade it is given, but can have a substantial effect on the way the diamond looks. Issues around the girdle are particularly easy to miss if you have no professional contact working on the diamond selection. To get the best diamond, you really need expert advice. Comparing oranges with oranges and apples with apples is very difficult for the general public who do not have, as we do, the experience of looking at thousands and thousands of diamonds over the years. It is for this reason that we choose not to take in work using diamonds supplied by clients. And of course, apart from the 4C’s, there are many, many other factors that affect the sparkle, lustre and brilliance and therefore price of any particular diamond. These are not even included in the 4C’s grading system, as their inclusion would just make the certification process very expensive and far too unwieldy. This is very common FAQ. No, not all diamonds are certified. Certification by a reputable lab such as the GIA provides you, the consumer, with independent verification that the diamond you are purchasing is the grade claimed by the seller. All diamonds above 0.50 ct sold by Ellissi are GIA certified diamonds. For diamonds between 0.15 ct and 0.49 ct it is optional to have a diamond with GIA certification. Below 0.15 ct the GIA does not issue diamond grading reports. It may do so in the future, although for the small sizes it is not cost effective, as the fee to produce the certification could amount to a cost greater than the value of diamond being certified. We have all the rings we make independently valued by a member of the National Council of Jewellery Valuers (NCJV). This valuation confirms the grades of any of the smaller diamonds supplied by us that do not have their own specific documentation. What Does a GIA Certificate Look Like? Please see below for an example of what GIA certificates look like. The first certificate is a full certificate. It is called a “GIA Diamond Grading Report”. Diamonds that are over 1.00ct. receive a full certificate. Under the full report, is a “GIA Diamond Dossier”. Diamonds that are under 1.00ct. have a dossier rather than a full certificate. The difference between the reports is that the full report has a plotting diagram of the inclusions within the diamond. This plotting diagram is not necessarily a comprehensive plotting of all the inclusions. Nor is it representative of the exact cut of the diamond. Both documents show “laser inscription registry” indicating both diamonds are laser inscribed. Laser inscription is where a diamond has had the certification number etched by laser on to the edge of the diamond, at its girdle. This is usually done at the time of certification and is an option that is decided upon by the cutter or dealer of the diamond at the time it is submitted to the grading lab. It is possible to have a diamond laser inscribed after the certification process. We simply submit the diamond to a competent lab with the necessary equipment. It is also possible to have more than just the diamond’s certification number inscribed, as long as enough space is available. In theory, you could have any details you like. Some might like their name, the engagement date or ” My other diamond is a 10 ct.”!! Really it is up to you. But be warned – it is not possible to add a laser inscription to a diamond once the diamond has been set into an engagement ring. This requires removing the diamond from the ring mount, which could, depending on the design, require a remake of the ring. Are all diamonds laser inscribed? The answer to this FAQ is no: not all diamonds are laser inscribed. Many diamond cutters (but not all) will have the diamond’s certification number inscribed on the diamond at the time of having the diamond certified. It is optional and adds around $50.00 to the cost of the diamond certification process. At present diamonds less that 0.15 ct. in weight are not certified by the GIA so these sizes are not generally laser inscribed. They may offer this service in the future, however it adds to the expense of the process. Another FAQ is can I have all the diamonds in my engagement ring independently certified? You can, but it would add a lot of cost to the ring. Having an engagement ring with say 20 or 30 diamonds set into the band and having all diamonds certified and laser inscribed would cost an additional $100 – $150 per diamond. This would give you an engagement ring with an additional price tag of many thousands just for the paperwork. As a result, we rely on registered valuers to provide an independent assessment of the diamond grade for the small diamonds in a engagement ring. What is a valuation and why is it important that you receive one? This is an often asked FAQ. A valuation is an assessment of a given item of Jewellery. To be worth more than the paper it is written on, it should be a document drawn up by an independent valuer, who is not part of the organisation that is selling you the diamond engagement ring. It is not uncommon for retailers to write their own valuations, even if they are not qualified valuers. They do so despite this being a clear case of conflict of interest. A proper valuation should be a document drawn up by a qualified valuer who is registered with the National Council Of Jewellery Valuers (NCJV). Valuations provided with engagement rings purchased overseas are not valid for insurance purposes in Australia, even if they are accurate. A valuation of jewellery is a description of the item/s and verification of the type of metal and its weight and the gemstone content of the piece. Any certification provided with the diamond is noted on the valuation. Registered valuers have a strict code of conduct and a set of detailed rules they need to apply to arrive at the final assessment of any given item. Once this is done they can then work out the full retail insurance replacement value for the item. This doesn’t necessarily represent the actual purchase price. It should not be regarded as a statement of the amount you should pay for an item. Why Is It Important That You Receive An Independent Valuation? Perhaps the first practical reason for having a valuation is that many insurance companies will require a valuation before they insure the ring. The value of the ring is assessed by the valuer for “Insurance Retail Replacement” purposes. It is so an insurance company, if you choose to have the item insured, can get a firm basis for the likely retail/ticket price prior to any discounts being applied. The second, and most important reason, is that an independent valuation is just that: it is an independent assessment of the diamond and of the ring itself. It is your assurance that you have received exactly what we have said we will supply. Ellissi provides an independent valuation from a valuer registered with the NCJV with all diamond engagement rings we make. How much is a diamond engagement ring? Surprisingly this is a common FAQ that is easy to ask but not so easy to answer. Diamond rings vary massively in both diamond content and diamond quality. There is no set cost that fits every engagement ring or every person’s budget of course. There is not even one fixed cost associated with a single design. Take for example the rings on our site. They can be quoted “as shown”. Or we can quote on the same design and in the same diamond weight, but in different grade levels. This will give rise to a range of costs. We can also make differing versions of the same design to smaller or larger scale. So you can see that there are many price possibilities on each engagement ring. Simply altering one area like the diamond’s colour grade can change the cost of the engagement ring substantially. Having this flexibility is one of the great things about having your ring custom made. This is the reason the engagement rings you see on this site are not all listed with firm buy prices. In fact, as the diamond rings shown on the Ellissi site are all engagement rings we have made and supplied to clients (actual rings now on client’s fingers), the cost was specific to that client at that time. The cost depended on the prevailing diamond prices of the day. 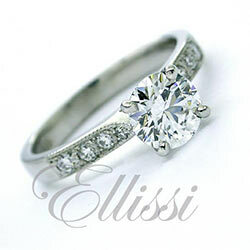 At Ellissi, we can of course quote on any engagement ring and diamond combination. However before doing so we need to first work out the most suitable grade and size diamonds for your available budget. The first step in working out how much your engagement ring will cost, is to to contact us about the ring designs you like or the diamond shape that you are interested in. From there we can have a look at what is going to be possible for your available budget. How much should I budget for a diamond engagement ring? Determining the budget for an engagement ring is a little tricky and can depend on who you talk to. Some say it should be 3 months wages, but I think it depends on quite a number of things – how you want the ring to look, what size and quality diamond you want, and the funds you feel able to commit to without selling everything you own. Really this is a difficult question to answer, as it is different for every couple. I think the best advice here is to work out into which financial bracket you fit into. By that I mean deciding what you have to spend on the engagement ring. This will make the process less confusing at the start. Pick a dollar range, as this will help to rule things in or out. i.e 3 – 5 k / 5 – 8 k / 8 – 10k / 10 – 15 k, or above. Once you have decided on a budget range, then we can look at the options in those areas for any given style or diamond type. It is at this point we can discover what is possible in suitable diamond grades and decide upon a course of action. Selecting a maximum budget level is the best way. You can always come down in price, but at the start it needs to be a workable amount you have set aside for the purchase, or at least intend to set aside. What is the best diamond grade? Of course the best grade in diamonds is the highest grade that can be given. However, the highest grades come at a cost. Most people, (even Bill Gates) will have a budget they prefer to work within. Sound, expert advice is crucial, so that a good balance between quality and size can be achieved without compromising on the brilliance and sparkle of the diamond. This link will give you information regarding the the 4 C’s. Of course, there is a lot more to great diamond selection than simply the 4C’s. Have a look under the “Diamond Education” section of the main menu for more info. Further information can be found in this link:recommended diamond grades. Our site has a lot of information on it regarding diamond grades and how to choose a great diamond, but there is only so much we can cover on the website, so it is always best to contact us whether it be via email or phone or by making an appointment to come and see us in person, so we can really show in greater detail what we do to choose the very best diamond we can for your budget. It is an important decision, involving a lot of money, as well as the symbolic significance the diamond has in your relationship. Oh and by the way, I am still awaiting Bill’s call. Now this particular FAQ depends greatly on where you sit on the two issues of best technical cut or the best shape for the ring design. It can be a difficult decision to balance, because you must decide, is the most important thing the refraction of the diamond, or is the ring design shape the thing you are most interested in? The best diamond shape for sparkle and refraction is the Round Brilliant cut diamond. However, this is just the best from the scientific point of view and the shape of the diamond will limit the design of the ring. Any shape diamond, if it is well proportioned, and of good quality, will in most cases, still look great. All diamond cuts that are not the Round Brilliant are to some extent a compromise from “Excellent cut”. However a round diamond may well be considered a compromise if the shape you actually like is a pear shape or cushion cut. The best diamond shape is the one you like the best really… Making sure you have a really nice, well cut example of its kind gives the diamond the best chance to perform well and look great on your hand. After all, if the diamond you select for your engagement ring is not a good example of its type, you cannot expect the engagement ring to look its best and sparkle. You really need to give it everything it needs… What it needs is a well cut quality diamond ! Platinum or white gold, which is best? This is a very common FAQ, and the qualities of the two metals are often misunderstood. Let’s look at them both in turn. A white metal, not related to gold. Platinum is very durable due largely to its denseness. Platinum is generally more costly than gold. It is also heavier, so you need more (by weight) to make any given design. Platinum is harder to work with because of its very high melting point (1772 degrees celcius). It is also difficult to polish. Keeping the polished look that the ring has when new is almost impossible due to the malleability of platinum. Is it more durable than gold? It is not exactly harder than gold, just denser. This means that it is longer lasting than gold, because it moves around rather than wears away, as gold does. Saying this, 18 ct gold still lasts for many, many decades if the ring is correctly made and well looked after. The bottom line: Platinum will cost more to supply. The ring cost will be higher because of time factors. Platinum is scratched quite easily. Re-polishing deep scratches and marks requires removing the surface. It is quite a difficult polishing job. Some jewellers will not work in platinum because of the difficulties associated with it. Platinum is a nice looking metal, however the surface will get abraded with wear. So yes it is white, but it does not have a great shine when compared to 18 ct white gold that is rhodium plated. On the positive side, it is a white metal will last 3 generations or longer, as long as the design has a good basis in construction i.e not really thin claws etc. 18 CT WHITE GOLD is an alloy (mixture) of yellow gold and palladium. The mix is 750 parts per 1000 of pure gold. This means that it is 75% yellow. The remaining 25% is a mix of metals, but is mostly palladium. The exact breakdown varies depending on the requirements of the alloy. That is why white gold is usually stamped “750”. Most of the alloy is of course yellow, because that is the colour of gold. Palladium is a white metal that is (on its own) too soft and difficult to work with. For this reason palladium is not generally used in making jewellery except as part of an alloy. The downside of 18 ct white gold is that the alloy is not quite white (because the alloy is mostly yellow). Good alloys have a kind of grey look. Cheap overseas alloys can be quite yellow because they save money in making the alloy by using less palladium. White gold is rhodium plated to give it a better colour. Rhodium is another white metal. This rhodium plating will come off over time on the exposed surfaces, especially around the back of the band where most of the wear occurs. The detailed sections on the design will remain white particularly in the grooved sections (if any) as to some extent they are protected. Where the rhodium mostly comes off is the back of the band, which will look a bit grey. White gold is very easy to re-polish compared to platinum. Re-applying the rhodium is quite easy if you have the proper equipment. Usually the cost will be around $65, depending on how well you look after your rings. This will need to be done every couple of years or so. How often will depend on how well you look after your rings. Eighteen carat white gold is very resilient. It is a bit harder than platinum. It will scratch, maybe not quite as deeply as platinum does. White gold lasts longer than you or I will ever need. Think of 18ct. white gold antique jewellery that is still around after 100 years (if it has been looked after). All gold jewellery wears out in time, especially if it has moving parts, such as bracelets or necklaces. I suppose there is a certain symmetry in the fact that gold wears away over many many decades. It is washed down the sink in tiny quantities, and ends up back in the earth, where it came from. Engagement rings will rub away over time against wedding rings and with general wear and tear. Have a look at your grandparent’s wedding and engagement rings and you will see the results of this wear and tear over the passage of time. The simple fact is that there is no single great white metal for jewellery. All have plusses and minuses. The cost difference in an engagement ring could be around $1000 between 18 ct white gold and platinum, depending on the metal costs at any given time. Metal costs rise and fall on a daily basis. Cost is also affected by the weight of the metal required to complete the job. When making Jewellery, you start with more metal than you finish with, so some cost is not totally recovered from the wastage (filings etc). Platinum can cost more in wastage than the finished piece, so this needs to be covered in the final price that is charged to the client. It is for this reason that I often advise that your money may be better spent on the diamond for the engagement ring, rather than paying extra for platinum at the expense of the diamond. A $1000 more put into the diamond will look better than the difference between the white metals. Can you damage engagement rings and diamonds? Rings are by no means indestructible, so damage can occur. Really, a sensible approach to looking after something that is valuable is required. The most common way to damage a diamond engagement ring is to wear it whilst doing something that is really abrasive, such as wearing the ring whilst at the gym. Using heavy equipment like weights etc WILL damage the metal and could also potentially damage or chip the gemstones. Yes, even diamonds are not indestructible and can be damaged in this way. For more info on the damage that can be done to rings and diamonds, click on the following links:caring for your engagement ring,. Blood diamonds where do they come from? Blood diamonds are diamonds that originate in countries that are judged to be in a state of conflict and the money generated from the sale of diamonds is being used to fund this conflict. Countries that are judged to be “in conflict” by the United Nations are excluded from selling unpolished diamonds to the main diamond industry. A system of verification of origin is in place with countries abiding by a number of checks and balances to maintain a clean supply of diamonds. This system of verification is called the Kimberley Process. Signatories to the Kimberley process agree not to trade in diamonds that originate from these areas, all importation and exportation of uncut diamonds must be accompanied by the correct documentation and verification of origin. Australia is a signatory to this agreement, as is the USA and many other countries. Jewellery trade organisations also agree to not knowingly deal in any diamonds sourced from countries that do not comply to and are signatories of this process. You can read more on this subject on our specific page “Conflict Free”. Does Ellissi do remakes and repairs to diamond engagement rings and other jewellery? Generally the answer is no, unless it is by way of assisting an existing client. In the main our workload keeps us so busy that it becomes really difficult to fit every request in, so repairs and remakes are just not possible. Can I supply my own diamond for mounting? A FAQ that raises a few very important points. People who can see the quality of our work often approach us to have their engagement ring made but think they can get a better deal by supplying their own diamond. It is true that you certainly can buy a cheap diamond with the same grade level as one we would supply. If we chose to, we could also supply the lowest cost diamond in the market. However, we would never supply the lowest cost diamond as the reason such a diamond is cheap is that there are issues with it. It would not be a diamond that we would be happy or willing to supply. Visit the beware dodgy diamonds page to see some photographs of examples of the dodgy diamonds we have rejected over the years. One of the main reasons our engagement rings look so good, is that we supply great diamonds. No amount of expert craftsmanship can make a poor looking diamond better than it is. As we deal directly with diamond cutters in the international market, and are ourselves manufacturing jewellers operating from our studio workshop here in Melbourne, our prices are great too! 1) Making diamond engagement rings is a complex job. Ring making requires enormous skill and great attention to detail. When a person buys a loose diamond, the decisions on the correct parameters for the ring design have been taken out of our hands. If the diamond is a poor shape or cut then this will have an adverse effect on the look of the final ring. For example, if a fancy shaped diamond (anything that is not a round brilliant cut diamond) has been poorly cut, and the faceting of the diamond is not symmetrical, the ring will always look crooked, even though the ring is perfectly straight. 2) Paying for any damage. Setting rings with diamonds is not done without risk of damage to the diamond. Setting a diamond ring requires applying a great deal of pressure to the diamond. If we are supplying the diamond, then we take on the risk of damage occurring to the diamond. If there is a problem, then we replace the diamond with one of equal or better quality than the original. We have insurance to cover this. There is a far greater risk of damage if the diamond is in some way deficient either in cut, shape or a bad choice in the clarity. A square shaped diamond with faults in the corners is particularly vulnerable to damage when it is being set. A whole corner of the diamond can be broken off. Making the ring mount only, as a service, does not give us any margin to take on this risk. 3) Risks in diamond selection. It is easy to become an armchair “expert” by reading the information (and misinformation) over the internet. The problem is that many people buy with price as the main driving force. This is fine if you are buying exactly the same product such as a particular brand and model of TV and you are comparing the price of the TV between retailers. Diamonds are not like TV’s! Every diamond is different, and their price reflects these differences. There are many, many pitfalls in buying on price alone. Understanding the way the industry prices diamonds requires years of training and experience. So, for example, even though two diamonds have the same grade given by the same grading lab, no two diamonds are exactly the same. Where there are price differences, it is often because a diamond may have just scraped into a particular grade level – say SI1. This could be on the borderline of being the next level down the scale – SI2. This diamond should be much cheaper than a diamond that is a very good “high” SI1. The good SI1 could be a borderline VS2 (the next level up), and will be priced accordingly. The range of diamonds that could be assessed to be in the VS2 -SI1-SI2 and I1 is very very vast and wide ranging. This is why big differences in costs occur within the same grade level. Additionally, a diamond’s clarity is graded by what can be seen from the top. This means that issues underneath and on the side of the diamond do not always change the grade it is given, but can have a substantial effect on the way the diamond looks. Issues around the girdle are particularly easy to miss if you have no professional contact working on the diamond selection. 5) Incorrect diamond grading and the risk to our business and reputation. I’ve saved this bit until last, as it is one of the most important issues. Just because a diamond has been bought as a graded diamond – take for example, F colour and SI1 clarity, does not mean that is so. The grading given to any particular diamond is, at the end of the day, someone’s opinion. Although all the labs use the same terminology, grading standards between laboratories vary. This means that the same diamond could be given two completely different grades if it were submitted to a couple of different labs for grading. This difference can often be between two and three grade levels. If such a diamond is worked on by a reputable jeweller and then re assessed at a later date and found to be not as high a grade as the client had originally thought, it becomes a real problem. This is because, through no fault of their own, the last person to have worked on the engagement ring (the jeweler) gets the blame for any subsequent discrepancy in the assessment of the diamond, even though it is nothing to do with the jeweller at all, it is just that the opinion of the first person who graded the diamond may not have been accurate. Therefore, using a diamond supplied by a client exposes us to a risk we simply will not take. Our business reputation has been built up over many, many years of good service and supplying great products to our clients. Our great reputation is too valuable to us to be marred by any issue of this kind. When we make an engagement ring we want it to be a great looking ring. We want it to be the best you can have for your budget. With no control over the diamond selection, we are not in a position to be able to guarantee this. Click here for more information about diamond grading issues. Do I need to visit in person to choose a diamond and have an engagement ring made? Many clients see us in our Melbourne studio workshop in person. We are not a retail shop as such and do not have sales staff. You are seen by one of our jewellers who are always working to deadlines. It is for this reason we request that an appointment be made prior to coming in. Many of our clients are not able to see us in person to make an appointment, often because of the location they live in. This is not an impediment to having a beautiful Ellissi ring. We provide a very comprehensive service to clients in locations all over Australia and indeed have many international clients as well. There is a lot of information on our website, but even this cannot cover everything in the vast world of diamonds. By contacting us you may be very surprised that so much can be achieved via email and/or the telephone. How long will it take to make the engagement ring? This is a FAQ we get asked all the time. We try as far as possible to have rings completed by about 3 weeks from the deposit date. This time line can vary from ring to ring. This is due to the complexity of some designs, our workload at the time, and possible difficulty sourcing exactly what you request from cutters in the harder to find diamond types. One thing is for sure – the best diamond rings are not the rushed ones. So please allow some leeway for the time that is required for us to do our work. Obviously we want to do the best job we can. Payment options are the usual type – Visa , Master Card, direct transfer via net bank. Direct deposit gives you the most buying power, although we are happy to look at a combination of credit and cash / net-bank. In the end you tell us what you can do and over what time line and we will look at it on a case by case basis. This FAQ is often asked. Buying an engagement ring is such a significant purchase and you want the ring you buy to last. Gold, platinum and diamonds do not rust or rot, so as long as you look after your ring, there is no reason to expect that it will not last for a lifetime and beyond. At Ellissi our workmanship is guaranteed for a lifetime, so you can be assured of the ring standard and the quality of our workmanship. This guarantee of course excludes general wear and tear or damage to a ring from misuse. Having said that, we try our best to rectify any issue regardless of the reason it has occurred. This is not always possible without some cost. We recommend all clients take out insurance cover against loss and damage. Insurance is a topic that we can cover in greater detail if you require. How do I look after my new ring? Do expect your engagement ring to get some dirt in the setting. Day to day activities such as washing your hands, putting on hand cream etc. all result in a residue building up on the surface of your ring. If you can, wherever possible, remove the ring whilst engaged in these activities and this will help minimize the build–up. I know it is not always possible when you are out of the house. When your engagement ring gets some grime in the setting, the best thing to do is to use a fine brush like a tooth brush (finer if you have something in your makeup kit), hot water in the sink with a good drip of washing up liquid on the ring and get a good froth happening, get the brush into the back / sides of the setting then rinse it off to check how good a job you have done. A minute or two of brushing should do it. Then blow the excess water out and dry with a tissue / soft cloth. For a great home clean that is a little more high tech than the toothbrush method described above, you can buy ultrasonic cleaners that don’t cost too much. These do a great job cleaning engagement rings and wedding rings. However, do not put other jewellery in them that may have stones glued in. It is best just to use the tank for jewellery that is set with diamonds and sapphires. If you are not sure, don’t use it as it is possible that damage may occur to other gemstones. It is also important to only use an ultrasonic where you know that the ring has been well made. If a ring hasn’t been set properly, it is possible that you could lose a diamond. How Do You Use an Ultrasonic Cleaner? All you need to do is fill the ultrasonic with hot water (about the temperature of a cup of tea) and put in a good few squirts of dishwashing liquid. More than you would ordinarily use to wash a sink full of dishes. Put your rings on a little hook, such as a paper clip. Turn the ultrasonic on and dangle your rings in the water. Wave them around slightly in the current for about a minute or so. Don’t leave them to rattle around in the bottom of the tank. You must suspend them in the water on a hook. Once you have had them in there for a minute or so, take them out and rinse them under warm water from the hot tap. Then you do the same as the toothbrush method. You blow the excess water out of the back of the rings and dry with a soft cloth or tissue. Don’t use anything that has a softening agent such as aloe vera on it. You can use a hair dryer to dry your rings. Do not hold it too close to the rings, as you do not want to over-heat them. You can expect that the gold will get a few scratches on it. It is softer than the average surfaces that it has contact with, such as door handles made of stainless steel etc. This is the case particularly at the back of the band, so expect some abrasion from day one. This can/will lead to a slight discolouration of the band, but it is unavoidable unless the ring stays in the box it came in. These scratches will disappear when you bring your ring in and we re-polish it. Re-Polishing and plating takes out all the small scratches and abrasions that have occurred over time. Your rings will look just like new again. White gold does require a rhodium covering from time to time to keep it looking white. Usually this is done every 18 months – 2 years. We will re-polish your rings at the same time. Jewellers (who have the equipment) will be able to do this for you. Generally, we charge around $65 (approx), depending on how well you have been looking after your jewellery. It is important to have a qualified jeweller check the settings. The claws on rings are very small and are made of relatively soft precious metals. It is possible for you to lose a diamond if you have caught the ring on things, or it has had a few hard knocks. The small claws can become damaged or pulled out of place if you are not careful with what you are doing when you wear the ring. We recommend re-polishing your ring around every two years as you do not want to over-polish the ring. Every time we polish the ring, we remove a little of the metal surface. If you have deep dents in the ring, we may not polish them all out, as this may remove too much metal. Re-polishing will remove scratches and small dents. Looking after your rings is the best plan, so clean it when you feel it needs it. Avoid the things that can really damage it – I am thinking here of the gym and other such activities like gardening and housework. It is best to remove your ring if you can, before engaging in these kind of activities. Wearing your ring to the gym whilst doing weights etc. will damage it. As gold is a fairly soft metal, any contact with other metals that are harder than it will cause damage to the ring. A good practice is to simply have a special spot where you put your rings when you get home, so that you don’t do housework with the ring on. Try not to beat yourself up over a few marks that will always happen. It is part of what gold is, but avoid damage where you can. FAQ: Is It OK to Wear Your Ring In Water? The answer to this FAQ depends on where you intend wearing the ring and whether or not it is important to you to keep the ring looking as much as is possible, its absolute best. Wearing your ring whilst showering won’t damage it. However, it will make the ring look dull as it gets a build up of soap scum on it. Wearing your ring to the pool won’t harm it. Wearing it to the beach might if you are digging in the sand with the ring on. Sand is abrasive after all. Also, if your hands get very cold, your fingers do shrink. Take care if this happens, as there is a risk of the ring coming off if your fingers shrink a lot. Of course applying sun screen whilst you are wearing the ring will leave a residue on the ring. It will look dull until you clean it again. Most of all, enjoy wearing your engagement ring. It is your little bit of pure crystallized carbon, billions of years old, a little bit of perfect stardust.